A new problem I found in VMware 5.5 is when you try to create a new Virtual Machine. I have never had any issues with creating new Virtual machines from scratch. However i had to create a new OS template and started the process but received error: Invalid datastore path. Looking online I did seem to find this error popping up alot but not related really to my problem. •Verify that datastore mentioned in the error is connected and accessible. •Verify that the file exists in the datastore. •Ensure that the file name does not contain non-Basic Latin characters. Kind of figure the problem storage or permission from error message so I went through my custom VM steps and under storage selection I always choose the Storage cluster and keep storage DRS enable so VMware make the recommendation of where to place the disks. This is where the problem lies for some reason…. 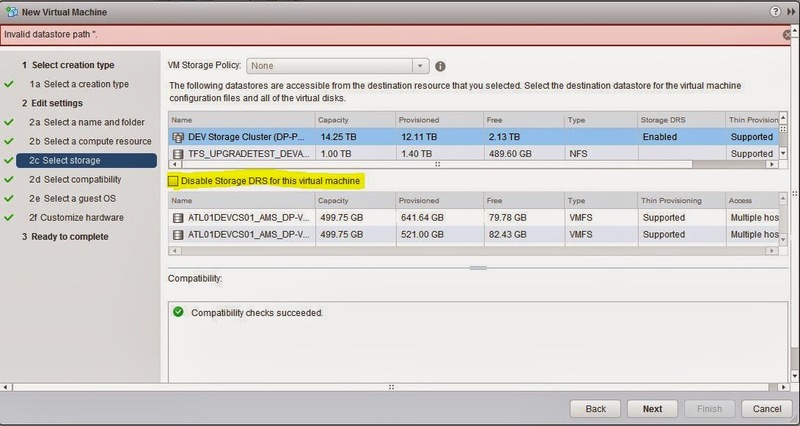 When you create the VM and under storage selection if you choose the storage cluster, make sure you disable Storage DRS for the VM and select the datastore manually. This seems to have fix my issues and I was able to create the VM successfully.